Mariah Carey’s ‘Infinity’ Remix Features Justin Bieber, T.I., French Montana: Listen Here! 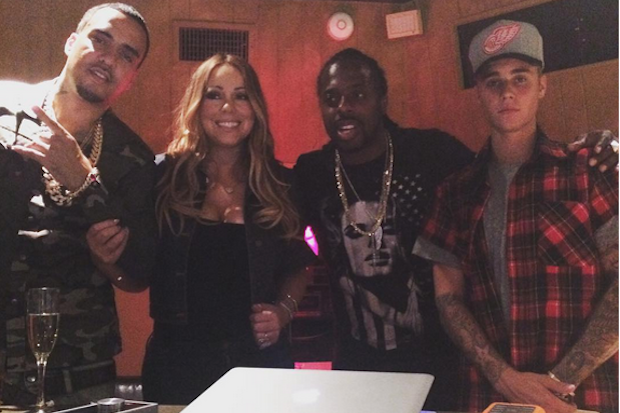 Against all expectations, it was discovered that Mariah Carey hung out in the studio with none other than Justin Bieber and French Montana just last week. According to TMZ, the reason was for an “Infinity” remix. Supposedly titled “Who You Mad,” the final track features T.I., Bieber, and Montana, with Carey solely on the hook. From a lyrical standpoint of view, all three artists imaged that Mariah would reject them. Just inagine, like in the “Infinity” music video, she checked out their Match.com profiles and agreed to see them in person, only to coldly shut the door on them. Here’s the problem: Two of them do not sound quite like grown men–and they get the longer verses. Montana’s rapping is loopy and and his warbling is pretty incoherent. Bieber’s attempts to sound hurt and pained just sound whiny. In addition, neither of their sug-rap jams are as tight as Mariah’s in her first verse of the song. “Infinity” is the one new song that Carey included in this year’s greatest hits compilation titled #1 to Infinity, which remarkably spans 15 years of incredible pop success. Previous ArticleChris Brown To Collaborate With Zayn Malik? Justin Bieber Takes A Tumble Off The Stage At Concert: See The Fall!